A bicycle and pedestrian greenway that connects protected bike paths on the waterfront to Queens Plaza and Queens Boulevard has become a parking lot, with private and government-placarded cars lining its southern curb for months. 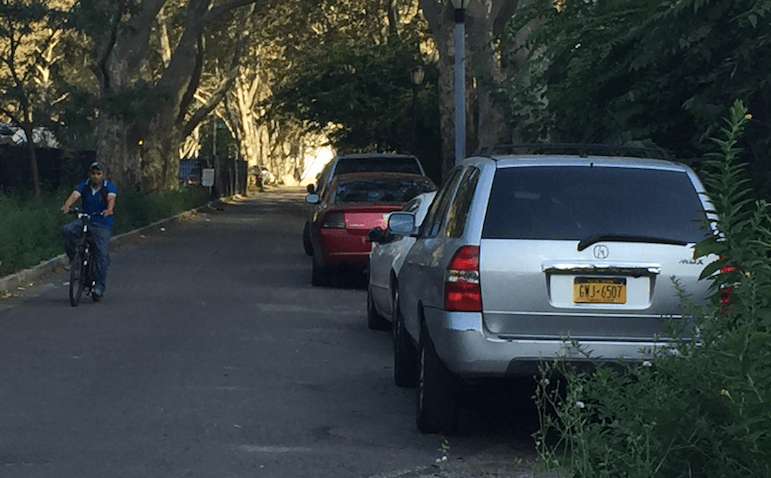 The Parks Department knows about the vehicles parked in the path and “has been ticketing when they are observed,” according agency spokesperson Meghan Lalor. But that hasn’t deterred people from leaving their cars on the greenway. The greenway, which is technically part of Queensbridge Park, runs for two blocks from Vernon Boulevard at the East River waterfront to 21st Street, between NYCHA’s Queensbridge Houses and the Queensboro Bridge. On Vernon Boulevard, motorists continue to park illegally under the bridge, blocking pedestrian access to the sidewalk on the west side of the street. Streetsblog reported last October that Con Edison employees were parking their personal cars there while making repairs to the bridge. I visited the location twice this week and found the greenway filled with parked cars. Some of them had Parks Department placards. In others, drivers displayed orange safety vests (at least one had the word “contractor” on it). Some of the cars had out of state plates. While Normandeau does not own a car, he said his neighbors who have cars pay to park in NYCHA-owned lots adjacent to the path. The Vernon Boulevard sidewalk is most often obstructed at night and on weekends, Normandeau said, which he attributes to people attending events at a nearby hotel. I found eight cars taking up most of the Vernon Boulevard sidewalk on the north side of the Queensboro Bridge. Some were apparently dumped there — all but three had expired registrations. At least two of the vehicles with current registrations had some form of NYPD identification on display. Lalor said abandoned cars are an issue in the area, and Parks can’t keep up with removing the ones left in areas that are under the department’s jurisdiction. “They are very often replaced,” he said. Normandeau has been trying to get illegally-parked cars ticketed for years, and keeps an online collection of photos dating from 2014. He said the 108th and 114th precincts, whose shared border runs along the bridge, refuse to take responsibility. Did you ask Jimmy Van Bramer for comment? Yikes! That is worse than I have ever seen it. Poor design and lack of maintenance bear a large part of the blame IMO. That stretch is much too wide, badly rutted, lined with litter, and feels more like a driveway for cars than a shared-use path for bikes and peds. It feels like a place no one cares about, and drivers are taking advantage of this. It’s an insult to the residents of the Queensbridge Houses that the city hasn’t rehabilitated it and cleaned it up. I pass here every day, it’s pretty bad. It’s really not really obvious that it’s a greenway. Why not put signs up and 2 big rocks preventing cars to drive into it? The fact there is no striping or glyphs on the pavement, make it just feel like a roadway that we are biking on. He is too busy fighting against affordable housing. Even if that’s true, the few residents that have cars are making life worse for everybody who doesn’t. That has always been my feeling. It’s been badly neglected as bike infrastructure has been built up on either end of it. If only there were a simple way to prevent people from parking illegally. Heh, ironically if you pan to the right in that link, there’s a car parked on the sidewalk (in a place with no bollards). What’s really amazing to the mind of an American is that this is an intersection of two streets that are one-way for cars and two-way for bikes. It’s gonna be decades before we see that here without a specific contraflow lane. Doesn’t surprise me. 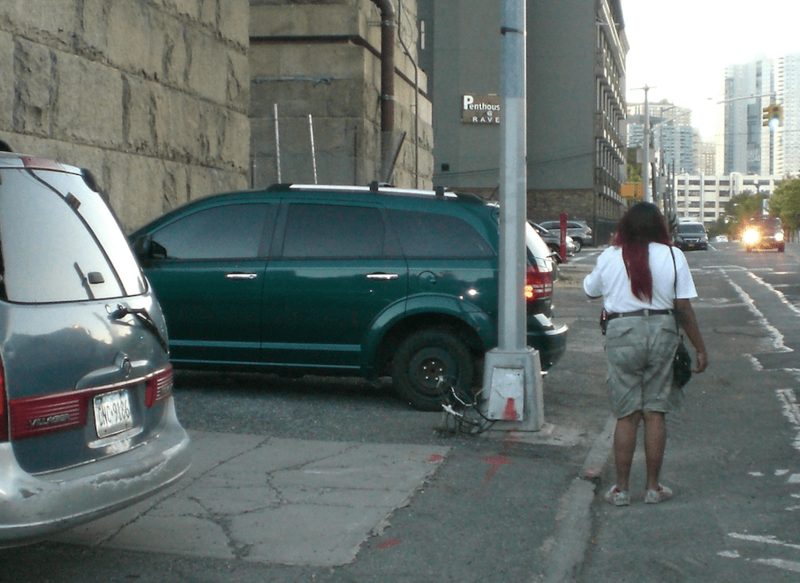 I’ve been unable to get the NYPD or the Department of Sanitation to tow away a vehicle under the BQE for months. They claim it’s not derelict. Two flat tires and smashed in windows and they still claim that it’s not derelict. I cycle through there all the time. I never realized it was a Greenway either. I just assumed it was some municipal parking lot you were allowed to ride through. this could easily be fixed with just a few bollards and signage. These need to be towed to a crusher’s yard, particularly the NYPD cars. I’d be in favor of vigilante towing at this point. Earlier this week, new pavement and bike lane markings went down on the path connecting the western Queens waterfront to Queens Plaza. 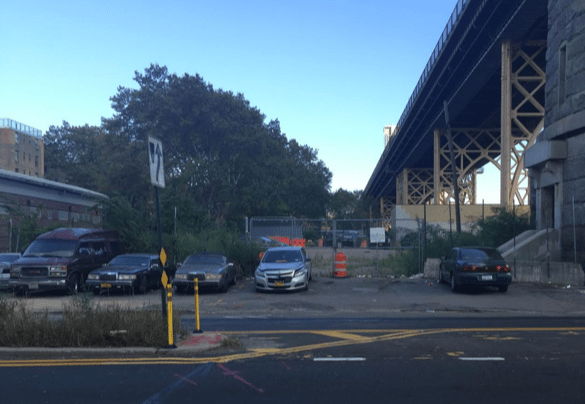 The path is still cluttered with illegally parked cars, but that's about to change, according to DOT.